Two summers ago, I wrote about our forays into pop-up programming for the summer. I mentioned in that post that I'd be assessing this volunteer-staffed, in-the-library, weekly activity model for the following summer, and my youth program team and I definitely considered all aspects of the program. What we ended up with last summer was an in-library program schedule with a much higher volume of activities--which meant we could focus our pop-up energies elsewhere. And so we did: to the bookmobile. What we discovered last summer is that we can pretty simply pop-up with activities for bookmobile patrons, but we have to provide staffing for every pop-up; our bookmobile staff see such a high volume of patrons at each stop that they can't lend one of their regular staffers to lead an activity. So for this summer, we considered what we'd learned, then iterated again. For 2017, we're sending activities out to the bookmobile once again. 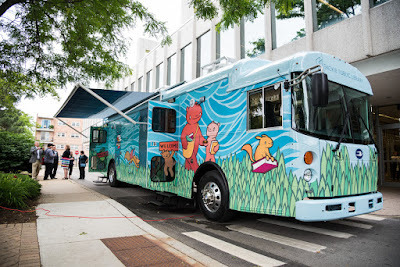 Since we know providing staffing is vital, and scheduling staff can be difficult during the summer, we needed to be really flexible to ensure that any staff member could confidently and competently lead a pop-up program with the bookmobile, little advance training necessary. And so we created Bookmobile Program Kits, each with video instructions that we can play at the pop-up. See, we got a magnificent new bookmobile a little over a year ago. This gorgeous library on wheels boasts an exterior awning, under which we can set up a folding table and lead activities. Also under the awning, beneath a panel on the exterior wall of the bookmobile, there is a flat-screen television. Which means we can play videos while we're set up under the awning leading activities. Thus our idea of how-to videos for bookmobile programming was born. We've only made a few pop-up appearances with the bookmobile so far this summer, but word is they're going quite well. 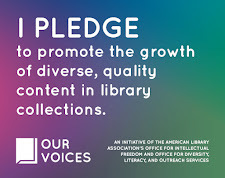 The short videos help to reinforce to bookmobile patrons that they can participate in the activity even if they only have five minutes--we've found most patrons plan enough time for browsing and checking out books, but don't plan to stay for a longer activity. Staff leading the activities have shared that the kits work well logistically: all the supplies are easily accessible, the activities don't require a huge amount of space for patrons to engage, and the video allows ease of participation even when there's a larger size group of eager participants. And no one forgets how to do an activity, because you have the how-to on a loop. At this point in the summer, we're considering these Bookmobile Program Kits a success. And a bonus: we didn't specifically brand the how-to videos as pertaining to the bookmobile pop-ups, so we can reuse them in so many potential programs and spaces in the future.